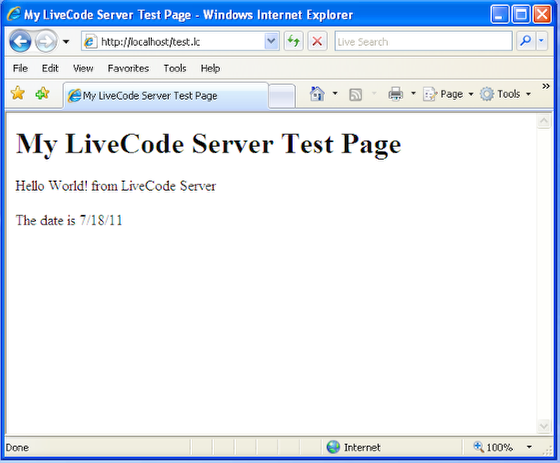 LiveCode LessonsLiveCode LessonsHow To - LiveCode Server Tasks Installing LiveCode ServerHow do I install LiveCode Server with Apache via .htaccess? If you are trying to set up LiveCode Server on a shared server, it will often be the case that you do not have access to the server's Apache config file. In this situation, you can configure LiveCode Server using a .htaccess file. This lesson will walk you through the steps required to install LiveCode Server with Apache using .htaccess files. Apache is the most most popular web server package available today. Installing Apache will allow your machine to function as a web server, hosting websites and serving web pages. If you do not have Apache set up on your systems already, you will need to download and install the latest version. Apache installers for Apache can be found here: http://httpd.apache.org/download.cgi#apache22. If you are trying to set up LiveCode Server on a shared server, it will often be the case that you do not have access to the server's Apache config file. In this situation, you can configure LiveCode Server using a .htaccess file. In order to use this method, your Apache installation will need to have .htaccess file enabled (http://httpd.apache.org/docs/current/howto/htaccess.html). These modules are usually enabled. If not, contact your service provider or server administrator to see if they will set them up for you. Begin by downloading the LiveCode server zip file using the instructions detailed in the lesson "How do I install LiveCode Server". Unzip the package and upload it to your "cgi-bin" folder. This file will tell Apache to map files with a .lc extension to livecode-script files, which should then get executed by the LiveCode Server CGI. Prev: How do I install LiveCode Server on Linux with Apache? Next: How do I choose which LiveCode Server engine to use with On-Rev? Hello, Thanks for this lesson ! I try to install Livecode community server on a Linux server via .htaccess but when I access to test.lc with a browser, I see only "ELF". I don't understand why. This sounds like this bug https://quality.livecode.com/show_bug.cgi?id=19293, which is fixed in the most recent versions of LC Server. I suggest using either LC Server 8.1.10 or LC Server 9.0.0. Thanks for your comment. I tried with LC community server 8.1.10 and 9.0.0 (stable), but I have the same "ELF".